Come VIBE with us! Whether it is your first or thousandth class, Villa Vibes has something for you. Practice yoga and cultivate a healthier lifestyle in a fun, non-intimidating environment. Sweat a little. Or a lot. Work on your body, mind and spirit. And do it with some laughter, great tunes and a beautiful community! Warrior 2s & Cold Brews - Yoga at Brewery Draconum! Buy Tickets now for only $14! Tickets include an all-levels yoga sesh, 1 locally brewed draft beer or other beverage, and 20% off an appetizer. Fall weather is here, and it’s the perfect time for outdoor yoga! Yoga sesh is only $15. Enjoy weekly raffle prizes and WINE WEDNESDAY at the Hyatt after class - all wine is 50% off. Contact Amanda with any questions by emailing villavibesyoga@gmail.com or call 661-388.3500. (Do not text). It’s Thursday and it’s time to take time for you. 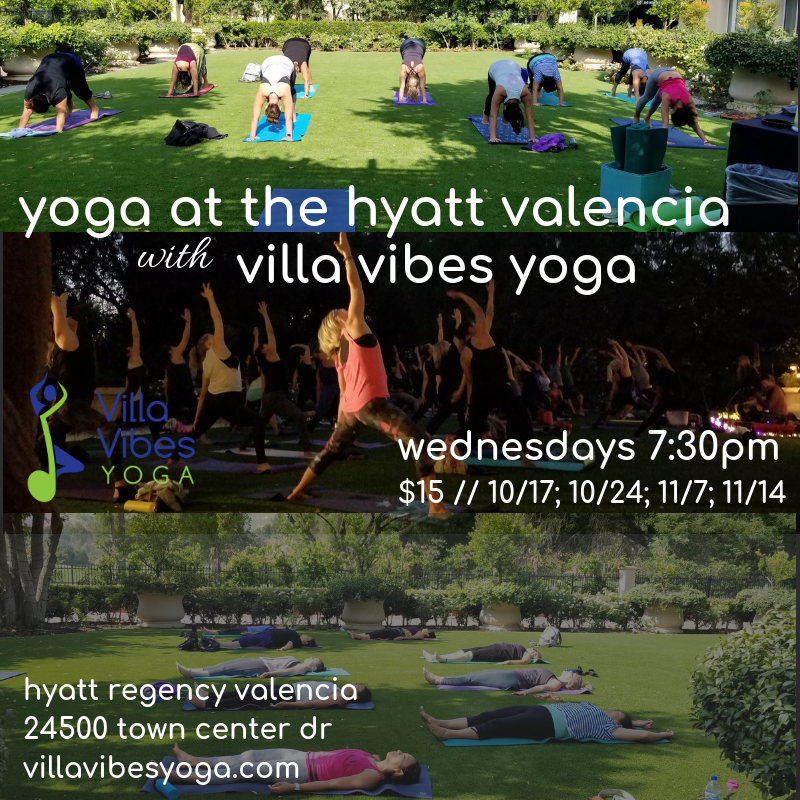 Join us at the Hyatt Regency Valencia for an energetic, refreshing Vinyasa Flow, and enjoy a glass of wine next to the fire on the outdoor patio after class! It’s the perfect opportunity to give your mind some love and connect with our fun yoga community! Tickets are $20. Includes all-levels yoga sesh and one glass of wine. Bring yoga mat, towel, and water. Reserve your spot now by sending $20 to @villavibesyoga on Venmo. Or purchase tickets at Eventbrite - click here. 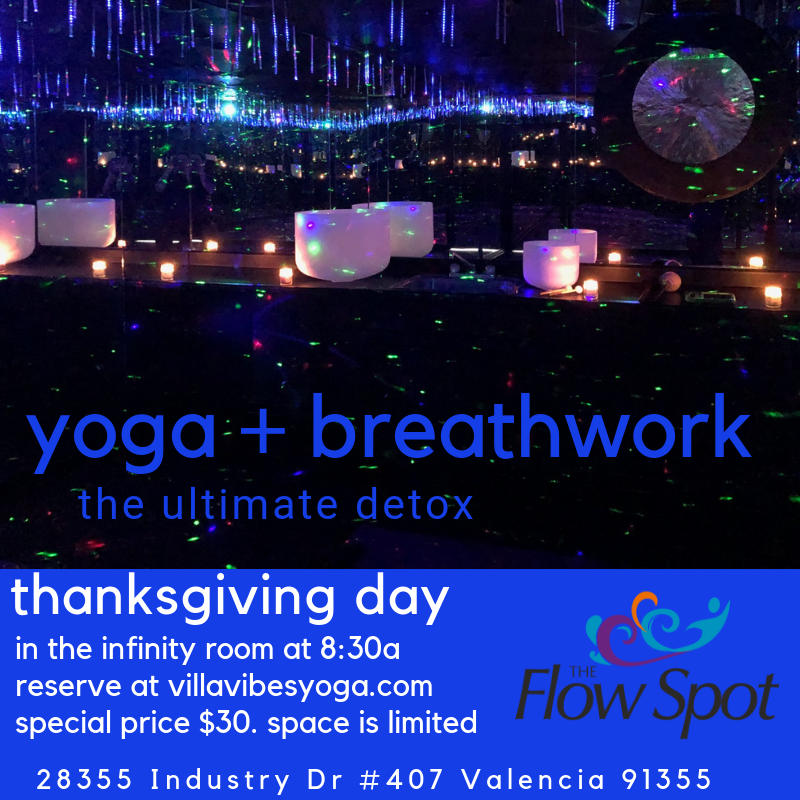 Come together with community on Thanksgiving Day for the ultimate detox -- yoga + breathwork! Amanda from Villa Vibes Yoga will kick off the morning with an energizing, detoxifying yoga flow in the amazing infinity room. Following the 45-60 min yoga love, Kenny from the Flow Spot will lead you in a group breathwork session, to bring make this morning one your body, mind and soul won't want to miss. It's the perfect way to bring self-care to your Thanksgiving holiday. Space is limited to only 14 students, so you must reserve your spot in advance. We are offering a special holiday price of $30 for this event. Reserve your spot HERE.